Within the school’s ethos and day-to-day school life, St Mary’s seeks to embrace the values cherished by Britain. Recently, the government has sought to describe what it sees as these values. We thought you would like to know how these can be seen in our school. St Mary’s is a UNICEF Rights Respecting school and as such has demonstrably engaged with many of these values. Please also see our audit of how our school promotes fundamental British Values in our curriculum. Each year the children take part in at least two elections. The school has a house system and each year members of the Year 6 stand for election as house captains, having presented their ‘manifesto’. Each year group also elects two representatives for the school council. The council meets on a regular basis with the headteacher to raise issues and explore ways of improving the school as well as helping to develop fundraising activities. The children also contribute to their end-of-year reports, sharing their thoughts and feelings about their school year, which is shared with the teachers and used to reflect on aspects of school life. The importance of following rules and laws is reinforced at school. In school, each class writes their own charter which supports the understanding that rules have a reason. Visits for Year 2 to Year 6 to Streetwise and Safewise introduces the children to the role of the Emergency Services. 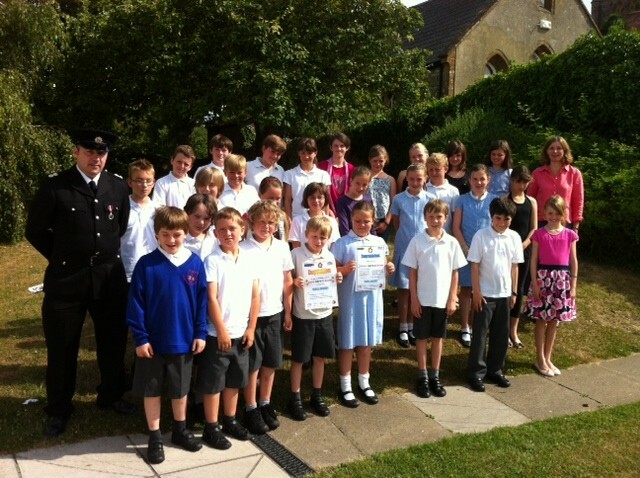 Pupils have been awarded Gold Level from the Dorset Fire and Rescue Service for their knowledge of how to stay safe. Regular visits by the Life Education Van, through PSHE lessons and within assemblies, pupils at St Mary’s are actively encouraged to make informed choices and are supported when exploring the impact of choices. Annual visits by Dorset Police for the E-Safety training also help children and parents to understand the challenge of having individual liberty. The rich range of after-school clubs gives children the chance to make personal choices. As a Rights Respecting School, St Mary’s actively promotes children to look beyond their class or school. The school contributes to the wider society in many ways: KS1 runs a litter picking campaign along the neighbouring lane, KS2 sing carols to the older residents in the village and participant in the village’s annual act of remembrance. Anti-bullying week at the school highlights concerns and issues about bullying, which is then followed up in individual classes and playground rules help ensure children respect each other. In a school where a significant number of pupils come from a similar background it is doubly important that tolerance is taught and understood by our children and staff. Through RE and PSHE children look at and explore different religions. The needs of children with different religious beliefs are positively welcomed and understanding promoted with other children. Visits to the local mosque and non-Church of England churches promote wider understanding. As a small school, St Mary’s is part of a cluster group of five schools and, through a number of shared residential activities, pupils mix with a more diverse group of children. The children have also visited larger schools in neighbouring Yeovil. St Mary’s continually strives to ensure its values embrace the richness of being British!